The coolest new bus meta to appear in The Flash this season has the ability to shrink and re-embiggen any object he wants. Buildings, guns, planes, cars, and yes, even people. If you’re thinking, “Hey! That sounds sort of like Atom, from Legends of Tomorrow!” then you’d be right. Sylbert Rundin — or “Dwarfstar,” as Cisco names him — stole some Dwarf Star alloy from Palmer Industries just before taking a special bus ride that led to him gaining these powers. Dwarfstar’s powers allow him to steal anything by shrinking it and walking away — but also allow him to keep cars in his coat pockets so he can casually toss them around, embiggening them just as they careen towards people. Over in prison, Barry’s busy using his newfound bonus powers to cheat at poker against his fellow inmates, but he also tries to use Team Flash to get Big Sir acquited. Dwarfstar’s appearance winds up being pretty timely because years ago, he was the one to frame Big Sir for murder. Barry leverage’s Team Flash’s resources to try and get him acquitted. When the plan doesn’t work, Barry just whisks Big Sir halfway around the world to the guy’s dream destination — only to expose his identity to the Warden in the process. Warden Wolfe is then confirmed as a bad guy in league with Amunet Black, who might buy Barry next week. Barry bonds with Big Sir, who knew his father back in the day. Inexplicably, Warden Wolfe is able to drug Barry by spiking the prison pudding which knocks him out of commission. Keep in mind, it took Cisco years to figure out how to get Barry drunk on account of his Speedster metabolism. 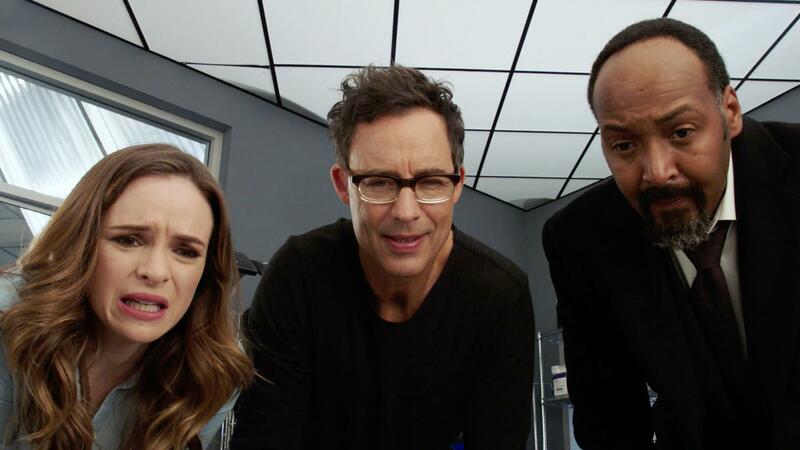 Another unexpected plot thread occurs when Lucille gains the ability to read minds on The Flash and Caitlin explains it as a temporary side effect of her pregnancy. Under normal circumstances, this would seem like a fairly interesting development, but one of The Thinker’s powers is mind-reading, we should all probably be concerned. Next week, Barry will have to deal with Amunet Black trying to buy all the meta-humans in Iron Heights — including the really cool Dwarfstar.